The Day of the Dead (Día de los Muertos) is a Latin American holiday that focuses on the memory of friends and relatives that have since deceased. 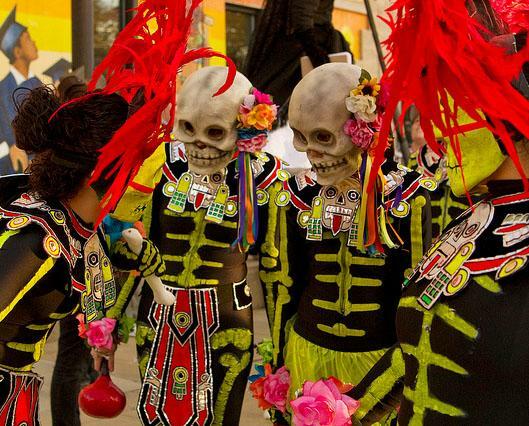 Despite the sombre subject matter, Dia de los Muertos is a day of partying, with celebrations and feasts being commonplace. Its background can be traced through the ages to an Aztec festival dedicated to the goddess, Mictecacihuatl. It is particularly renowned in Mexico, where it has status as a national holiday. The celebrations take place on the 1st and 2nd days of November, and are connected with the Catholic holidays, All Saints’ Day, and All Souls’ Day. Resemblances between the holidays include building altars to remember the dead, as well as honouring them with their most enjoyed foods. Sugar Skulls and Marigolds are also traditionally used to honour the dead. Conventionally, people will go to graveyards to be with the souls of their deceased friends and relatives. Graves are visited with both consumable and ornamental gifts. Deceased children are often brought toys, whereas adults are brought bottles of alcohol and jars of atole. The food brought to the cemeteries is eaten by the attendees, but some believe that the spirits of the dead consume the “spiritual essence” of the gifts. The private altars which contain the dead individual’s favourite food and drink also contain photos and possessions. The intention is for the souls of the dead to visit the altars so that the prayers and thoughts of the attendees can be sent to them. Sugar skulls are a popular symbol of the Day of the Dead, and the symbol is becoming increasingly prevalent in contemporary culture outside of Latin America. Sugar skulls now enjoy popularity as a commonplace tattoo due to their decorative yet dark nature. They also feature in artwork and illustrations outside of what would be considered traditional Latin American art. The Western World has embraced some of the symbolism of the Day of the Dead, even if it doesn’t necessarily celebrate the traditional festivals. Celebrations do vary between different regions of Latin America. 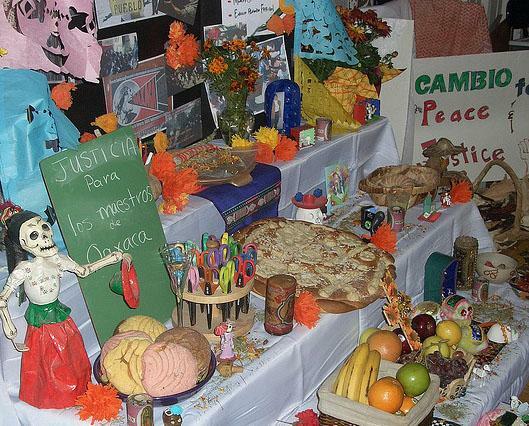 In Guatemala, the Day of the Dead involves creating giant kites, and the eating of a dish called Fiambre, which is only eaten during this particular holiday. In Haiti, Roman Catholic and Voodoo traditions are mixed, and loud drums are played at all night cemetery celebrations to wake the ‘Loa of the Dead’, Baron Samedi, and his mischievous children. Kevin, the author of “The day of the dead (Latin American Holiday) is a fashion designer for the Sugar Skull Clothing a UK fashion brand.